A civilian trade unionist dragged from his home and murdered in Guadalajara in April 1939 days after the end of Spain’s bloody 1936-39 civil war has finally received a dignified burial after his remains were identified in June following a court-ordered exhumation from a mass grave containing the remains of 27 other individuals. 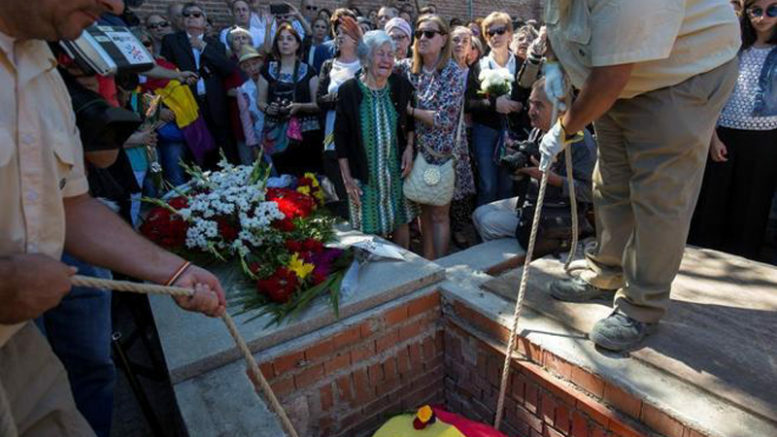 Timoteo Mendieta’s remains were buried at the weekend in the presence of his 91-year-old daughter, Ascensión, who was just 13 years old when she saw him taken from their home and dragged away for execution by forces under the command of Gen. Francisco Franco to topple Spain’s democratically elected Republican government. Franco went on to rule Spain with an iron hand in a dictatorial regime that lasted until his death in 1975. Throughout all the years of dictatorship, through Spain’s period of Transition to democracy and even after the passage of the country’s 2007 Law of Historical Memory authorizing the exhumation of remains of individuals buried in common graves in order to provide a dignified burial and relief to victims’ families, Ascensión Mendieta had to wait to have her father’s remains identified and bury him with dignity in an individual grave. After repeated delays on the part of Spanish authorities, she finally flew to Buenos Aires at the age of 88 to ask for help from Argentine judge María Romilda Servini, who issued a warrant based on international human rights law calling on Spain to exhume the remains from the common grave in Gaudalajara where Timoteo Mendieta was believed to be buried. After a Spanish court finally complied with the international warrant, the historic first-ever court-ordered exhumation of a Franco-era victim since Franco’s death was begun in 2016 and the process completed in June of this year, with the positive identification of Timoteo Mendieta’s remains.